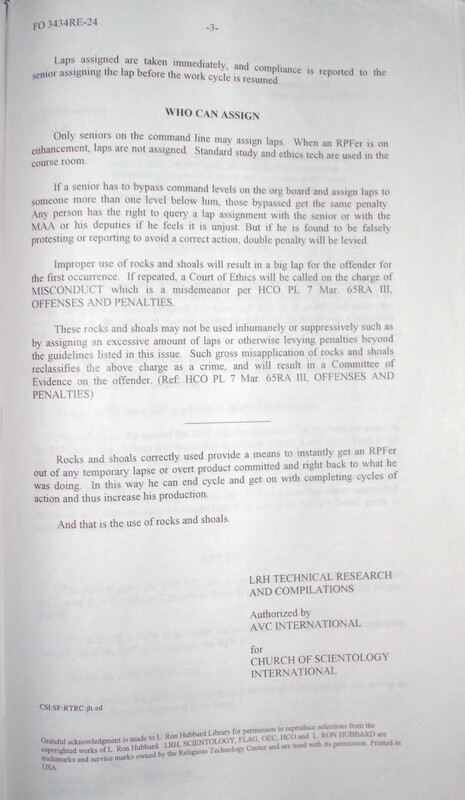 The first rocks and shoals were drawn up by the Flag RPF MAA in 1976. These provided an on-the-spot means to correct someone on the decks, get them out of any temporary dejection and get them right back onto doing what they were doing. Over the years these rocks and shoals have proven quite workable. The RPF rocks and shoals do not replace standard ethics. But they do provide a fast means to get someone to end cycle on an error, goof or overt product on the decks and get on with it. 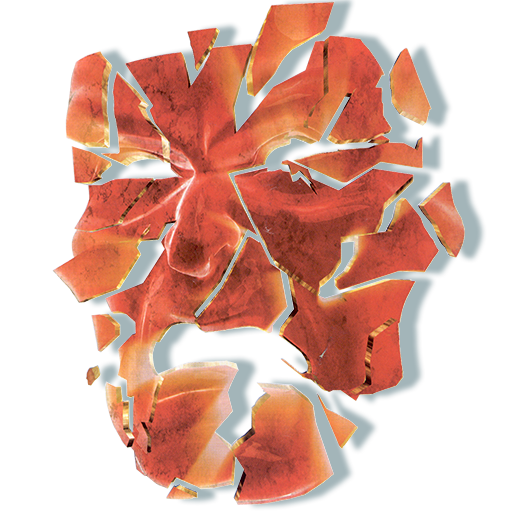 Repeating or continuous errors, major overt products, signs of PTSness, or other indicators would be handled with standard OEC Volume I ethics tech. Rocks and shoals were not intended to be, nor have they been used as, punishment over the years. Even though they require physical exertion they were never meant to cause pain or duress and in fact they don’t. 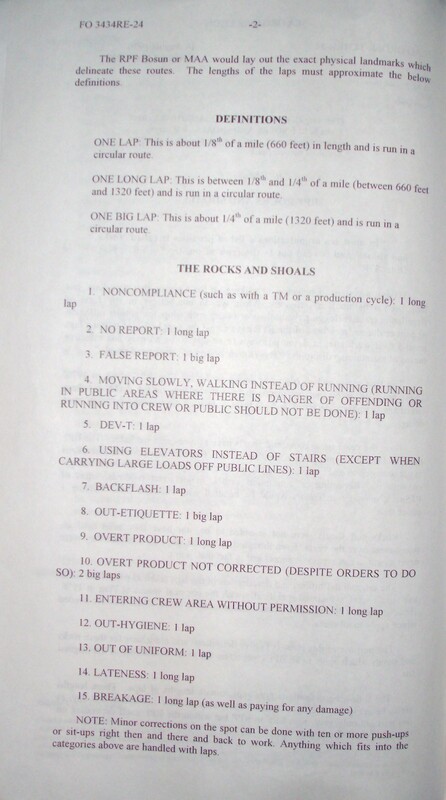 The original definitions and descriptions of the laps taken as part of the rocks and shoals were associated specifically with the physical spaces at Flag in 1976. However, with RPFs in different locations around the globe, definitions are needed which apply to all areas. 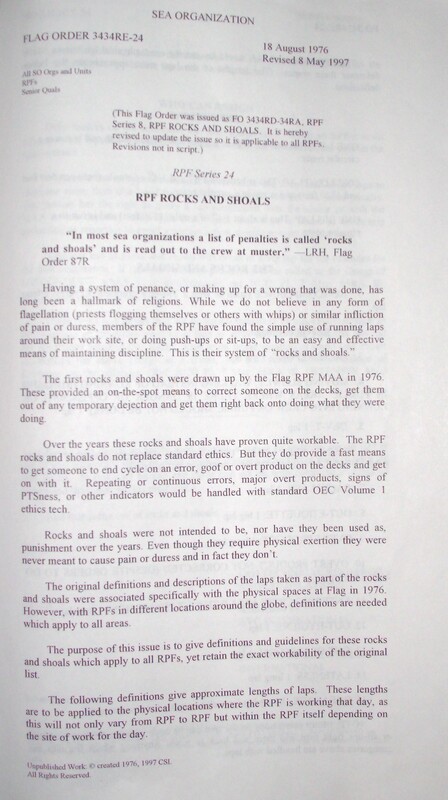 The purpose of this issue is to give definitions and guidelines for these rocks and shoals which apply to all RPFs, yet retain the exact workability of the original list. The following definitions give approximate lengths of laps. These lengths are to be applied to the physical locations where the RPF is working that day, as this will not only vary from RPF to RPF but within the RPF itself depending on the site of work for the day. Unpublished Work: © created 1976, 1997 CSI. The RPF Bosun or MAA would lay out the exact physical landmarks which delineate these routes. The lengths of the laps must approximate the below definitions. ONE LAP: This is about 1/8th of a mile (660 feet) in length and is run in a circular route. ONE LONG LAP: This is between 1/8th and 1/4th of a mile (between 660 feet and 1320 feet) and is run in a circular route. ONE BIG LAP: This is about 1/4th of a mile (1320 feet) and is run in a circular route. NOTE: Minor corrections on the spot can be done with ten or more push-ups or sit-ups right then and there and back to work. Anything which fits into the categories above are handled with laps. Laps assigned are taken immediately a senior assigning the lap before the work cycle is resumed. Only seniors on the command line may assign laps. When an RPFer is on enhancement, laps are not assigned. Standard study and ethics tech are used in the course room. If a senior has to bypass command levels on the org board and assign laps to someone more than one level below him, those bypassed get the same penalty. Any person has the right to query a lap assignment with the senior or with the MAA or his deputies if he feels it is unjust. But if he is found to be falsely protesting or reporting to avoid a correct action, double penalty will be levied. Improper use of rocks and shoals will result in a big lap for the offender for the first occurrence. If repeated, a Court of Ethics will be called on the charge of MISCONDUCT which is a misdemeanor per HCO PL 7 Mar 65RA III, OFFENSES AND PENALTIES. Rocks and shoals correctly used provide a means to instantly get an RPFer out of any temporary lapse or overt product committed and right back to what he was doing. In this way he can end cycle and get on with completing cycles of action and thus increase his production. And that is the use of rocks and shoals.